Nylon was the world's first true synthetic fiber. It was discovered in 1934 by Dr. Wallace Carothers. He found a strong polyamide fiber that stood up well to both heat and solvents. Dr. Carother's process, known as polymerization, would lead to the development of other synthetics, including Antron® carpet fiber. In 1959, bulked continuous filament (BCF) nylon was introduced. 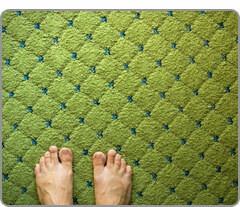 This, along with Antron® nylon, introduced in 1960, revolutionized the carpet industry. Today, the revolution in synthetic fibers is carried out by INVISTA - an enterprise firmly focused on the future. As the producer of Antron® nylon, the most specified brand of commercial carpet fiber, INVISTA carries with it a proud legacy of scientific achievement. It is the world's leading integrated fiber business and paves the way for ever more economical, desirable and sustainable products for our consumers. McCurley’s has flooring products designed for every Home or Office application! !